This enchanting end table features a round beveled glass top that rests on floral cast pucks, shaped and fluted legs and a rope twist and egg and dart carved apron. Measuring 28-inches in diameter, this table offers enough surface area for a lamp or modest display. The cast resin base is finished in Brushed Pewter and features a beautiful, interlaced center. Add other tables from the Galloway collection for a coordinated group. The Galloway Traditionally Styled Round End Table with Beveled Glass Top by Magnussen Home at AHFA in the area. Product availability may vary. Contact us for the most current availability on this product. 37504B Round End Table Base 1 22" 22" 24"
37504T Round End Table Glass Top 1 28" 28" 1"
Case Construction Cast resin and wrought iron with fiberglass appliqué accents. 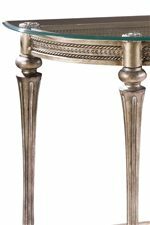 Timeless and elegant in detail and design, the Galloway Occasional Table Collection is crafted from cast resin and wrought iron with a weathered metallic, Brushed Pewter finish with burnished accents. Galloway's table aprons feature a rope twist carving bordering an egg and dart design, and decorative floral pucks show beneath fragile and clear beveled glass tops. Each table boasts fluted and shaped legs connected by decoratively intertwined stretchers. The Galloway collection is a great option if you are looking for Traditional furniture in the area. Browse other items in the Galloway collection from AHFA in the area.